Affordable excellence for both the business and leisure traveler. Best Western Sawtooth Inn & Suites provides many amenities, including a deluxe continental breakfast, 24-hour indoor pool and spa, exercise room, local calls, fax and photocopy services, lobby guest computer and complimentary USA TODAY. Our new conference center can accommodate all of your meetings, banquets, weddings, and groups. We offer outstanding on-site catering and are wired for all of your technology needs, including a video, slide, and overhead projector, retractable screen, DVD, VCR, Power Point, sound system, and high-speed Internet. "All of our guest rooms include wireless high-speed Internet, a mini-refrigerator, microwave, premium cable w/HBO, an iron and ironing board, data ports, hairdryers, and one-cup coffeemakers. 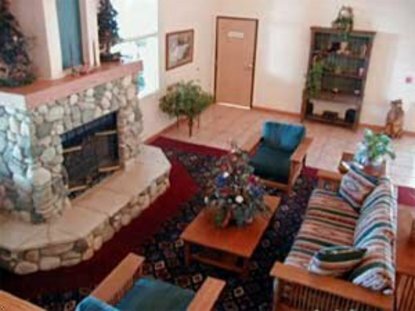 Our suites also offer a microwave, mini-refrigerator, and sitting area. Our newly opened (March 2003) all-suite/executive addition also offers ethernet access to high-speed Internet and sofa sleepers." All travelers will find our hotel staff to be friendly, efficient, and knowledgeable. We take pride in maintaining our high standards of excellence and look forward to seeing you on your next visit.